Many thanks to the Music, Theatre & Dance alumni who attended the 2009 reunion. The events were a huge success and we’re already looking forward to the 2010 reunion, homecoming weekend, October 14-17, 2010. Several of this year’s Music, Theatre & Dance reunion activities will be held in the School’s newest building, the Walgreen Drama Center. This will give us a chance to reminisce about our time at Michigan while experiencing the newest facilities used by current U-M students, faculty, and staff. The 2010 celebration will start with a Back-stage tour of Hill Auditorium at 2:00 p.m. on Thursday, October 14, followed that evening by the 1960 Alumni Gala Dinner at the Michigan League. I’m pleased to report that John Morgan (BM ’60, MM ’62 music education) and Alveris Van Fleet-Corson (BM ’60 music education) will represent the SMTD Class of 1960 on the 50th Reunion Committee. The reunion continues on Friday, October 15 with the annual State of the School Address from Dean Christopher Kendall in Walgreen Drama Center’s Stamps Auditorium at 11:15 a.m. Later that day, the third annual Alumni Open Choral Sing will also be in Stamps from 3:00-4:30 p.m., this year led by Jerry Blackstone, chair of the conducting department, and open to all SMTD alumni and University graduates 1960 and prior. Following the Sing, please join SMTD alumni, Dean Kendall, faculty, staff, and students for the SMTD Reception and Alumni Awards Ceremony, 4:30-6:30 p.m. in the Towsley Musical Theatre Studio in the Walgreen Drama Center as we celebrate the 2010 Alumni Award recipients and members of the Class of 1960. The celebration will continue with the U-M Homecoming Game on Saturday, October 16 and a student-led tour of SMTD facilities on North Campus on www.music.umich.edu/reunion; invitations will be mailed later this summer. I’m also happy to announce the results of the 2010 Board of Governors election. New members whose terms began January 2010, are: Toni Auletti, MFA ’95, theatre; Jane Brockman, BM ’71, theory, MM ’73, DMA ’77, composition; Lizzie Leopold, BFA ’95, dance; Robert Raddock, BM ’74, MM ’74, trombone. Board members reelected to a second term are David Eisler, Joe Gramley, and Matthew Rego. Finally, a special thanks to everyone who participated in the Alumni as Mentors program during the past year. We are still receiving great feedback and look forward to continuing this tradition at Homecoming 2010. Go Blue! Larry Rachleff, MM ’79 (band conducting) and MM ’79 (percussion), who is now celebrating his fourteenth season as music director of the Rhode Island Philharmonic, also serves as director of orchestras at Rice University’s Shepherd School. Known for rapport with orchestra musicians, he is in constant demand as a guest conductor and was chosen as one of four American conductors to lead the Cleveland Orchestra at Carnegie Hall under the mentorship of Pierre Boulez. An enthusiastic advocate of public school music education, Rachleff has conducted all-state orchestras and festivals in virtually every state as well as throughout Europe and Canada. He has collaborated with leading composers including Samuel Adler, Luciano Berio, George Crumb, Michael Daugherty, and John Harbison. 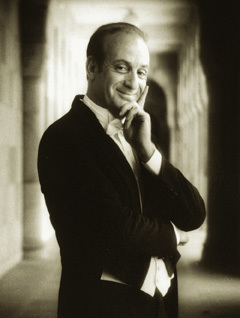 Scott Piper, MM ’95 (voice), is known for his rich, resonate tenor and charismatic stage presence, both of which have established him as a sought-after interpreter of opera’s romantic leading men: the Duke in Verdi’s Rigoletto, Don José in Bizet’s Carmen, Rodolfo in La bohème, Edgardo in Lucia di Lammermoor. After Piper’s performance in L’elisir d’amore, “there was a stillness, as if the audience did not want to break the magical spell woven by the honey-toned tenor, so exquisitely nuanced in text and music. Then a frenzy of applause erupted” (Opera News). Piper had his Italian debut at the Teatro di Verdi in Busseto, Italy, and appears as Alfredo in the new DVD of Franco Zeffirelli’s production of La traviata, conducted by Placido Domingo. Jeremy Kittel, BFA ’04 (jazz & improvisation studies, Emerging Artist in Music, won multiple U.S. National Scottish Fiddle Championships before taking up jazz as a student at the School of Music, Theatre & Dance. He has toured widely with his own band and as a soloist at venues as divergent as Carnegie Hall, the Milwaukee Irish Fest, the Detroit International Jazz Festival, and A Prairie Home Companion. Kittel has produced four CDs of his own, his most recent Chasing Sparks. Now a full-time member of the Turtle Island Quartet, he just finished recording their new CD Have You Ever Been?, an album in tribute to Jimi Hendrix. He recently performed at Disney Hall in Los Angeles with Bela Fleck, opening for Steve Martin. Esther K. Chae, MA ’95 (theatre), Emerging Artist in Theatre, is an award-winning actor and writer. Her credits as a performer include noted television shows like Law & Order: Criminal Intent and West Wing. Her theatrical work has been seen on stages around the country, most recently a solo theatrical performance, So the Arrow Flies, about a North Korean spy and the Korean-American FBI agent who pursues her, lauded as “fascinatingly gripping.” The work, which has been featured at festivals and on theatrical stages here and in Korea, is being adapted into a feature film script. Chae, a certified stage combatant, trained in Korean drum and mask dance, was the subject of a Korean Broadcasting Station documentary on her life in Hollywood. Michael Spencer Phillips, BFA ’99 (dance), Emerging Artist in Dance, was off to the Merce Cunningham School immediately after graduation, on scholarship, soon joining the company as a member. In 2002, he found his artistic home with RIOULT, a contemporary dance company under the artistic direction of Pascal Rioult. With them, Phillips has toured the U.S., Mexico, Europe, and Africa. As a teaching artist, he restages Rioult’s ballets. He has taught master classes in Poland and Russia, as well as at universities, conservatories, and private studios. Other performance credits include Battleworks Dance Company, New York City Opera at Lincoln Center, DRA’s Fire Island Dance Festival, and the Bill T. Jones/Arnie Zane Dance Company. In 2009, Mr. Phillips co-founded the Rioult Circle, the company’s board of young patrons, for which he acts as co-chair.